PDXpert product lifecycle management software is a simple, flexible and affordable PLM solution. PDXpert software efficiently manages product data and processes to ensure that your organization's design information is accurate, reliable, controlled and available throughout the entire product lifecycle. Multi-user secured access, including "electronic signature"
PDXpert PLM software's powerful features and low cost offers an ROI that can be up to 5 times faster than other PLM vendors' solutions. 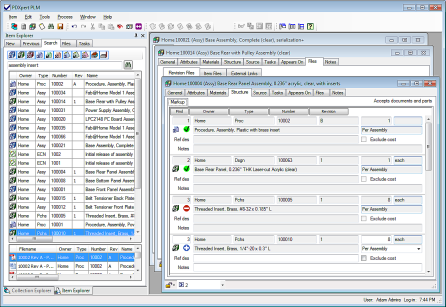 The PDXplorer PDX Viewer opens engineering design packages that conform to the IPC-257x standards for Product Data eXchange (PDX). 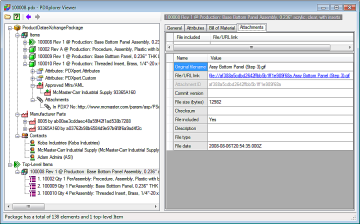 Product lifecycle management (PLM) applications often export PDX packages to downstream manufacturing and support applications that can import product data. PDXplorer offers a clean, straight-forward user interface, coupled with an adaptable data parsing engine. Since PDX files can occasionally have varying attribute values depending upon the IPC implementation, PDXplorer examines common format differences to determine how best to open the PDX file. PDXplorer PDX Viewer is FREE - view PDX files at no cost, securely on your own computer. Copy individual tree nodes, grid data elements or complete item grid contents for pasting into emails & work instructions. When first introduced in 1994, Acseni was the product data management (PDM) workhorse for smaller manufacturing companies. Its nominal system requirements and ground-breaking affordability made it a good choice for engineering departments with up to 10 users. Although ASI no longer offers Acseni to new customers, we support existing customers via an upgrade program to our PDXpert PLM software. To preserve your product data investment while adding significant new capabilities, let us convert your system to PDXpert software. Please contact us for details.